Notts players and owner Alan Hardy have been subjected to heavy criticism this season as the financially stricken League Two club faces relegation. The club said a number of comments "overstep the line between fair criticism and vile, threatening abuse". The number of bans, nor nature of the comments, have been disclosed. 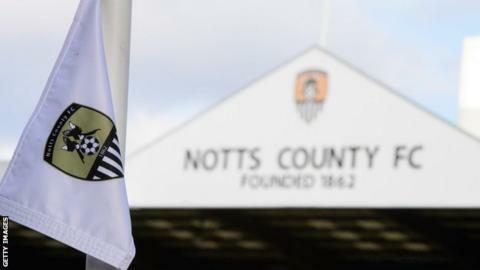 Notts County said formal proceedings against "the protagonists" will soon begin, having reported one "particularly malicious tweet" to Nottinghamshire Police. "Legal advice is being sought in relation to comments made by other individuals," a club statement said. BBC Sport has contacted Nottinghamshire Police for comment. Notts, bottom of the English Football League and two points from safety following Saturday's 3-0 defeat at Crewe, said they accept their season has been "bitterly disappointing and frustrating for fans" and respect their "right to voice their displeasure". However, the Magpies said recent abuse, which the club says has had a "knock-on effect on the families" of those targeted, "cannot and will not be tolerated". Premiership rugby club Leicester Tigers last week took similar action, reporting incidents of "disgusting personal abuse" of player and their families to police and social media platforms.